You can see the proposals at <www.budapest.hu>, which are the union of the two city flags. The Red-white-green stripes are not the colours of the national flag, but these are the colours of the flag of City of Buda 1703-1873. The flag of Budapest before 1989 was: White with the Coat of Arms, but without the Holy Crown and the two animals, but with the great red star on the "blue river"
Between 1948/49-1966/68 no CoA and no flag. Between 1968/73-1989 was a CoA and it was used on white field as flag. 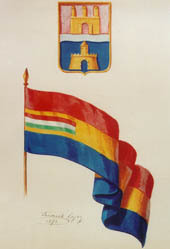 The first proposals of Budapest flag and CoA made by Lajos Friedrich in 1873. 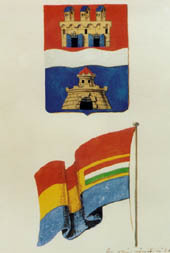 Proposals of Budapest flag and CoA made by Guszt�v Altenburger in 1873. After the WW I., after the Rumanian occupation in Budapest, the city council changes the blue colour to green. Too much time they had to see the Rumanian colours in our capital- they said. This flag had been used from about 1920 to about 1950. The change of the colours (blue/green) was in 1930! The red-yellow-blue flag was used 1873-1930. The red-yellow-green flag was used 1930-1946/1950. The present flag is the red-yellow-blue from 1989. This flag (without the CoA) appears at Dr. Sz�ll S�ndor: V�rosaink neve, c�mere �s lobog�ja (1941) . A 3:2 yellow-red-yellow-red-yellow-red-yellow horizontally divided flag. Is this the flag of county of Buda, or of the city of Buda? According to by Sandor Kiss (HMKS) , this is Budapest 1974-1989 flag. I spotted this flag in Budapest (in Buda, actually) in 1997. I am afraid that this flag never was flag of Budapest. I see this flag on the City Hall of Budava'r (Budapest I. district)! It also flies on the two entrance gates of the upper city of Buda, and I guess it shows the limit of the Budavar district (does Budavar exactly match the upper city of Buda?).?). The toll gates are also painted in yellow and red. So the flag might have been the flag of Buda before the merging of Buda and Pest in Budapest. No, the territory of the "Community of Budapest I. district Budav�r" is greater (included the old suburbs around the Castle Hill: Tab�n, Krisztinav�ros, Viziv�ros (Wasserstadt), Naphegy (Sun Hill). In the book "Sze'll S.: Va'rosaink neve, ci'mere es lobogo'ja, Bp 1941" I found this flag as the flag of Buda, but in the official homepage of Budapest there is the red-white-green flag 1703-1873. This flag appears at Dr. Sz�ll S�ndor: V�rosaink neve, c�mere �s lobog�ja (1941) as "Buda before 1872, Pest-Pilis-Solt Co.".